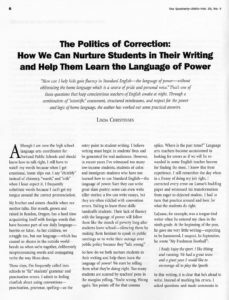 Summary: This brief yet powerful article by Linda Christensen is sure to encourage thoughtful and extended professional dialogue among educators grappling with dilemmas about students’ home and school language. Christensen describes practical strategies for honoring students’ home language while also helping them achieve greater command of the gatekeeping language of power, standard English. This article would work equally well as an introductory reading in an extended professional development institute or as a central focus reading in a shorter workshop. Although I am now the high school language arts coordinator for Portland Public Schools and should know how to talk right, I still have to watch my words because when I get emotional, home slips out. I say “chimbly” instead of chimney, “warsh,” and “crik” when I least expect it. I frequently substitute words because I can’t get my tongue around the correct pronunciation. My brother and sisters chuckle when our mother talks. Her mouth, grown and raised in Bandon, Oregon, has a hard time acquainting itself with foreign words that have become part of our daily language—burrito or futon. As her children, we struggle too, but our language—which has caused us shame in the outside world—bonds us when we’re together, deliberately mispronouncing words and conjugating verbs the way Mom does. So how do we both nurture students in their writing and help them learn the language of power? We start by telling them what they’re doing right. Too many students are scarred by teachers’ pens in the margins yelling, “You’re wrong. Wrong again. Ten points off for that comma splice. Where is the past tense?” Language arts teachers become accustomed to looking for errors as if we will be rewarded in some English teacher heaven for finding the most. I know this from experience. I still remember the day when in a frenzy of doing my job right, I corrected every error on Lamar’s budding paper and witnessed his transformation from eager to dejected student. I had to turn that practice around and look for what the students do right. When the halmut toches my Head my body turns Like doctor Jeckel and Mr. Hide. I become a safage. And there’s no one who can stop me when this happens. My blood starts racing my hart pumping. Like a great machine of power. And when that football moves that’s the time for me to move and get that quarterback. And anyone who get’s in my way is asking for problems. His paper went on for two error-filled pages. But in this passage he wrote with passion about a topic he cared about. This comes when a student is freed from the teacher as marksman waiting to “correct” every word. In my response to his paper, I pointed out what he was doing right. For example, I love how he uses similes and metaphors throughout the paper. He also uses strong verbs: touches, racing, turns, pumping. Using Shaughnessy’s scientist analogy as a model, at the beginning of each year I sit with my students’ papers and categorize each student’s errors, looking for patterns. I keep this list for myself, so I can work with students to eliminate their errors one at a time. I also create a personalized page for each student on my computer. [See figure 1 and figure 2 at end of article.] As I work with students on their errors, I hold them accountable to self-correct before turning in a final draft. LaJuane’s paper, for example, demonstrates problems with capitalization, apostrophes, spelling, and basic sentence structure. I tackled capitalization first because it was the easiest problem to solve. Then I made him accountable for checking to make sure that he used capitals correctly. By just correcting the capitalization problems, LaJuane eliminated many errors. Once he mastered that convention, we moved on to another. When I first explain this process, it sounds so time consuming that teachers nod and turn away. Believe me, I am not a martyr. At Jefferson [High School in Portland], I taught three 90-minute block classes, typically around 90 students, but I would continue to keep track this way even if my student load was 150. Because each student’s error chart is on my computer, I can just update it regularly and print it out when I hand back papers. It actually takes less time than marking—and remarking—the same errors on paper after paper. It is also more effective. When I mark student errors, instead of making them responsible, I’m doing all of the work. If students read their error sheets and make the changes, they do the work. Also, they have to review their error sheet prior to turning in final drafts, so I see fewer errors as the year moves on. Frequently, many students in my classes make the same errors—punctuating dialogue, for example—and I can teach minilessons. In fact, when possible, I find the best way to deal with these problems is to ask students to generate the rules. They remember their rules far longer than when they read the rule and correct the errors in a punctuation exercise. When I’m teaching students the rules around dialogue, I copy a page from a short story or novel that demonstrates many of the rules—a piece of dialogue interrupted by an attribution, a question, a dialogue where the speakers change but there is no attribution. Then I put the students in small groups and ask them to write up five rules for punctuating dialogue and to include an example for each rule. After checking to see if the rules are correct, we post the rules on the wall as a reminder during writing time. Students also learn that if they forget the rules, they can just pull down a novel that has dialogue and figure them out again. Sometimes the “errors” are part of a student’s home language. In that case, the “correction” process needs to make it clear that the student isn’t “wrong,” but that each language has its own way of making plurals or using verb tenses. Students need to explicitly learn the differences between their home language and Standard English. In my classes, I attempt to honor language variations by studying—and honoring—their use in literature first. After reading authors who employ home language and Standard English—Lucille Clifton, Jimmy Santiago Baca, Lois Yamanaka—the class discusses which genres and situations call for them to code switch between their home language and Standard English. Students are quick to point out that when writing poetry or dialogue in narratives—genres that call for informal language—they may choose to use their home language. But when they are writing essays, college or job applications, state writing tests—genres that call for formal language—they may choose Standard English. As a teacher in a predominantly African American school where the majority of students exhibited some features of African American Vernacular English (AAVE, also called Ebonics or “Spoken Soul”), I needed to learn the rules and history of the language so I could help students move between the two language systems. Them old Chuck Taylor high top nasty looking Converse these are the ugliest shoes I had ever seen. I thought as I put them on. “Mom why I have to wear these ugly shoes.” My mom say they was in style. While Larry made some basic errors in punctuation, many of his “mistakes” correctly use the grammar structure of AAVE. This can be difficult for a teacher without a linguistic background to understand. As Geneva Smitherman noted in her groundbreaking book Talkin’ and Testifyin’, “Linguistically speaking, the greatest differences between contemporary Black and White English are on the level of grammatical structure.” It looks like Larry’s errors are simply grammatical, but if a teacher studied the grammar of Ebonics/AAVE, she would recognize that he follows many of the linguistic features of black vernacular. For Larry, simply correcting these grammar errors without acknowledging their roots in his home language is not only inefficient, it sets Standard English up as the “correct language” and AAVE as wrong. Larry needed to understand how he was transferring the “logic” of his home language into the sentence structure of Standard English, and he needed to know how and when to change that. The lack of a be verb in the run-on sentence, “I don’t see how they raggedy” is another example of Larry following the rules of AAVE. In mainstream English, the sentence would read: “I don’t see how. They are raggedy.” This is called zero copula—or the absence of an is or are—which are called copulas because they couple, or join, a subject (in this case, “they”) and a predicate (what’s said about the subject—in this case that the shoes are raggedy). In order for Larry to code-switch, he had to be aware that he was using AAVE, which has a complex set of rules and restrictions—especially around the verb be. According to the Rickfords, “As with most rules of spoken language, no AAVE speaker has ever been taught these things formally, and few speakers could spell them out for you (unless, perhaps, they had learned them in a linguistics course). But AAVE speakers follow them, almost religiously, in their daily speech.” And, I would add, many students translate their spoken home language into their writing. I grew up thinking Ebonics was wrong. My teachers would say, “If you ever want to get anywhere you have to learn how to talk right”… At home, after school, break time, lunch time, we all talked our native language which was Ebonics. Our teachers were wrong for saying our language wasn’t right. Their language wasn’t right in our eyes. All I heard was Spanish and Ebonics in my neighborhood. Until they brainwashed me at school to be ashamed of my language. And that almost took away one of the few things that African Americans had of our past life and history. Teachers at a predominantly African American middle school formed a study group to analyze their students’ errors and study AAVE. The majority of the teachers in the group are African American. During a discussion one morning, a teacher pointed out, “I always told my students what my teachers told me, ‘Read your writing out loud and correct those places where it doesn’t sound right.’ One of my students said, ‘But it does sound right. '” The teachers discussed this point for a while. “It sounds right because it sounds like the way we talk at home. It can sound odd when we use Standard English.” The study group helped us clarify that our old piece of advice might work with Standard English speakers, but not with students whose home language is not the same as school language. Once students begin—error by error—to understand how to “clean up” their writing, they gain confidence in their ability. They no longer feel like targets in the cross-hairs of the teacher’s red pen; they don’t need to “wash history from their throats” as Patricia Smith so passionately writes in [her article] “Talking Wrong.” Teachers exercise enormous power when we take our pens to student papers. Will we use our power to help students understand that Standard English is one dialect among many, or will we use it to whittle away students’ voice and home language one error at a time? Do you need the capital? the question: Is this the beginning of a sentence? Is this a name? AAVE uses subject and a pronoun, SE uses one or the other. You wrote: My mother she went to the store. In SE: My mother went to the store. You wrote: My mom say they was in style. In SE: My mom says they [are/were] in style. the shoes are raggedy). SE inserts the is or are. You wrote: I don’t see how they raggedy. In SE: I don’t see how. They are raggedy. Lippi-Green, R. 1977. English with an Accent: Language, Ideology, and Discrimination in the United States. New York: Routledge. Rickford, J. 1997. “Suite for Ebony and Phonics.” Discover Magazine, December 1997. Available here. Rickford, J., and R. Rickford. 2000. Spoken Soul: The Story of Black English. New York: John Wiley & Sons. Shaughnessy, M. 1977. Errors and Expectations: A Guide for the Teacher of Basic Writing. New York: Oxford University Press. Smith, Patricia. 2003. “Talking Wrong.” Rethinking Schools, 18 (1): 20-24. Smitherman, G. 1997. Talkin’ and Testifyin’: The Language of Black America. Boston: Houghton Mifflin. Yamanaka, Lois. 1996. Wild Meat and Bully Burgers. New York: Farrar, Straus & Giroux.